On this highlights tour of Colombia, experience a great sample of everything this Caribbean treasure has to offer. From lively Bogota, to fascinating coffee country, and finally to beach-side Cartagena, this itinerary shows what there is to love about Colombia at a relaxed, yet active pace. Today's exploration begins at La Candelaria. Located in Bogota’s heart and soul, this is the oldest part of the city. The Plaza Bolivar (Main Square) is the focal point of this historic part of the city. As you wander the streets of La Candelaria, your guide will not only explain the history of Bogota, but also the intricacies of current Colombian culture and daily life. There will be time for a refreshment stop in one of the local coffee houses to take in the culture. After a visit to the Botero Gallery, you will continue to the Gold Museum, which houses one of the finest collections of Pre-Hispanic gold in the world. This is absolute must see in Bogota, houses more than 35,000 pieces of pre-Colombian gold work in the collection. Many of the works are said to be unsurpassed by goldsmiths of today and it’s easy to see why, when studying the examples. This golden raft is one of the focal points of the display and was the driving force in the Spaniards quest to find El Dorado. A three course lunch will be awaiting you at the museum, after your exploration. We will visit one of the most attractive coffee estates, Café San Alberto, to witness the daily activity on this traditional hacienda. Coffee cupping with an expert will bring our senses to a higher level. 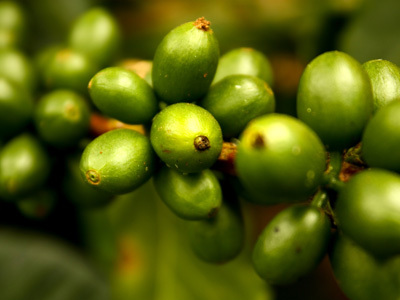 This excursion has been specially designed for those who want to dive deep into the cup, while enjoying one of the best views over the Quindio Valley and probably the best coffee as well. Your guide will arrive at your hacienda this morning and take you on a tour of the surrounding region. This tour will take you from the far northeast of Quindío to the beautiful Valle Cocora where the magnificent Wax palm grows, in one of its few natural habitats, then onto the first settlement in Quindío of the modern era. 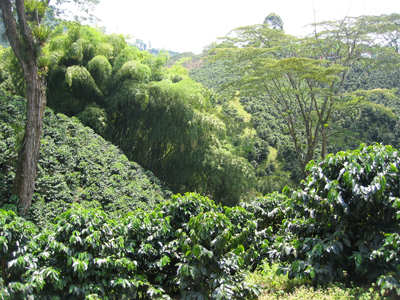 As you enter into Filandia, the first stop, you know you are in the Coffee region of Colombia. The main square has not changed in appearance or in character in decades. Filandia does not have an attraction to visit; Filandia is the attraction. A coffee break in one of the many small coffee shops will allow you to take in the quaintness of uninterrupted lines of brightly painted houses in this traditional Pueblo of the region. The guide will explain about the culture and people of the region and how small pueblos (Villages) like this form the back bone of rural agricultural life, if you want to feel like you are seeing Colombia then look no further. From Filandia you will drive to the Valle Cocora (Cocora Valley). Part of the wider Parque Nacional Los Nevados, the valley is located on the eastern limits of Quindío along the central Andean range, and has been regarded by Colombia as a sanctuary for its national symbol; the Wax Palm (Ceroxylon quindiuense). The Palms cover the Mountain range, which is now protected and declared monument to protect the tree itself and the endemic species that depend on it. The valley is spectacular and great for walking or horseback rides, either way this stunning mountain scenery will not fail to impress. Salento is a municipality in the north eastern part of the region of Quindío. This picturesque town boasts a number of fine houses of traditional architectural style. Rimmed by distant snow capped mountains, Salento has a real rural traditional feel. Medellin has undergone a major positive transformation in the past 10 years, one of the main pillars of which is urban architecture. The construction of parks, pedestrian zones, museums, transport systems, libraries and schools, public spaces has not only improved the city’s public spaces, but has also had a strong positive influence on its social dynamics. Today's tour will begin in the working-class neighborhood of San Javier, famous for its open-air electric escalators. The escalators were built in 2011 to replace the 350 stairs leading to the top of a steep hill and thus to improve the local residents‘ mobility. Your guide will take you around the neighborhood and give you some special insight into some of the social initiatives that are taking place in the area. After visiting the San Javier library park, you will have the opportunity to ride on the aforementioned electric escalators and enjoy a beautiful view of the city from the top of the hill. The city tour will also take in all principal sites and locations of this fascinating location. 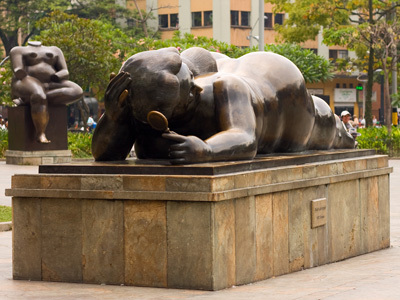 These sites will include the “Plaza Botero" the famous Botero sculpture park where many giant sculptures of Colombia most famous artist and Medellin born sculptor Fernando Botero are exhibited. A ride on the city’s famous metro and cable car system to reach Santo Domingo. 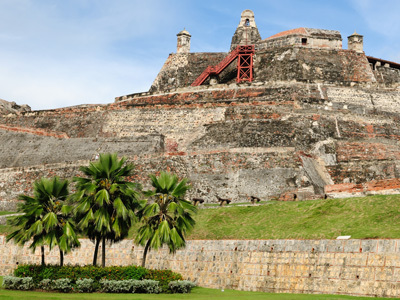 Embark on a half day tour of Cartagena visiting the Inquisition Palace & San Pedro Claver. The top spot to stay in La Candelaria, de La Opera is on a lovely cobblestone street adjacent to the Teatro Colón. Enjoy live-music shows on Friday and Saturday nights, as well as complimentary use of the pool, Jacuzzi, and sauna. The hotel is two restored colonial homes, and the results are impressive. The restorations give the buildings their original, colonial glory. All guest rooms are decorated Italian style. The spacious, beautifully decorated suites are well worth a splurge. 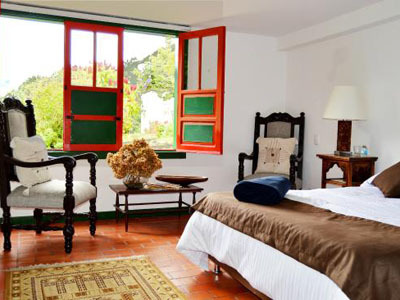 The terrace restaurant, El Mirador, offers great views of La Candelaria, as do most of the hotel's rooms. The hotel prides itself in creating an atmosphere dedicated to ecotourism in Salento, Quindio, an area that is part of the Coffee Cultural Landscape of Colombia. This region was recognized in 2011 as a World Heritage Site by UNESCO, which is a testament to the outstanding example of sustainable production and cultural landscape of Salento. The lodge is set in a beautiful coffee house that is more than 100 years old, surrounded by 100 acres of amazing landscape. It is located three kilometers away from the town of Salento on the road to the Cocora Valley. In Hotel Park 10 you will feel the warmth of your home. The highly qualified staff will offer an unforgettable service and the luxurious facilities are designed for your utmost comfort. This boutique property features grand decor, spacious rooms and lovely amenities. From the tropical outdoor space, to the wood interiors, sparkling tiled floors and elegant brickwork, there is something to be appreciated, everywhere you look on property. On site, there is a delicious restaurant, relaxing spa and fitness room. Featuring 23 beautifully designed luxury guest rooms and a perfect central location, Anandá Hotel Boutique offers an intimate retreat in the heart of the city. 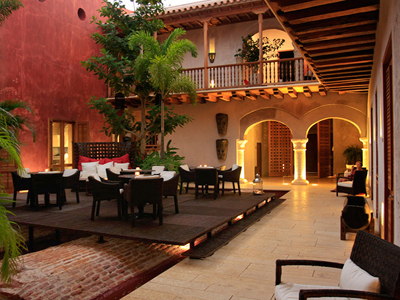 Located in the historic center of Cartagena de Indias, just a few blocks from Santo Domingo Square, this beautifully restored colonial house is the perfect destination for romantic vacations and honeymoons or a relaxing corporate gathering. Designed to instill a deep sense of peace and tranquility, the accommodation at Anandá exudes charm with every detail, from two-story suites with private balconies to smaller rooms with Jacuzzi tubs and private terraces. Onsite amenities include a pool, two terraces, and a third with a Jacuzzi, day beds, a gym and a Grand Salon. Carmen Restaurant offers contemporary cuisine with a fusion of ingredients and preparations from all over the world. The menu is inspired by fresh products and modern cooking techniques, providing a variety of options from local grouper, octopus and artisan cheeses, to duck, steak and the best pork belly you’ve ever tasted.